The Back Story: Torea is a traditional ketch designed by Sparkman & Stephens and built of steel by Abeking & Rasmussen in 1968. Her unique design with a clipper bow, raised stern deck and transom windows echoes back to square rigger days. She is a development of Yankee IV, which was the last vessel built for Irving and Exy Johnson, a new England couple who sailed around the world seven times aboard the Brigantine Yankee. The Johnsons’ voyages became famous through a series of books and National Geographic articles. What’s inside? 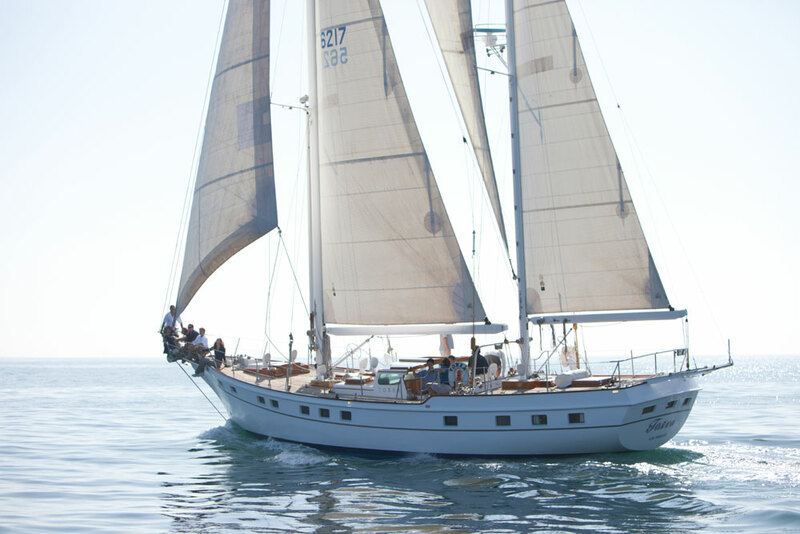 With her lofty rig and unique “mule” staysail, Torea can pack a lot of sail, making her a good sailing boat even in light winds. Her full keel and rounded bilges make her a comfortable voyaging boat, fully capable of taking care of her crew in all weather. Torea’s large mid-ships cockpit provides good protection from the elements. Torea has hydraulic roller furling on all sails; allowing for setting and furling sails from the cockpit. She is powered by a single Gardner 6 LX diesel. Yachts of this type are known for their great cabins, which are aft in the boat, and flooded by light from all the ports and skylights. Torea’s cabin is a captain’s retreat, comprising a writing desk, navigation table, a large head with a tub, and a raised double berth. The forward cabin features a real ship’s galley, dining area, double guest cabin to starboard with ensuite head, and a crew cabin forward. Historic notes: On deck and below, Torea displays the best of traditional design and craftsmanship. For more than a century, the famous Abeking & Rasmussen yard has produced the finest yachts in the world. Today, the yard focuses on building yachts of 100 feet or larger. Where Currently Berthed: Torea was owned by the same gentleman for 40 years until he donated her to the School of Sailing and Seamanship at Orange Coast College. She is now for sale through Ardell Yacht and Ship Brokerage. Torea will be open for inspection at the Lido Boat Show Sept. 18-21.